What does salvation mean in the urban context? What theme could more appropriate on November 5th than religious tolerance? After all it is the night when we remember the failure of Catholic activists to blow up Parliament and kill the King. An event we have celebrated for over 400 years by gleefully burning effigies of the most celebrated conspirator, Guy Fawkes, who was tortured, then hung, drawn and quartered for his role in the plot. For atheists and secularists, religious based terrorism and the violent retribution that normally follows is high on the list of objections to faith playing any part in public life. If we just do away with all this religious nonsense then surely people can live tolerantly in a rational society? As have been seen in the recent furore about Stonewall’s ‘Bigot of the Year ‘award, accusations and counter-accusations of both secular and faith-related intolerance create fury like little else. And for many Christians it can lead us to emphasise tolerance so strongly that all claims of objective truth are abandoned in case they upset someone. Faith becomes diluted to meaninglessness. As the philosopher Alasdair Macintyre complained, Christian liberalism was “giving atheists less and less in which to disbelieve”. When Christianity loses a sense of conviction it easily becomes pale and watery and devoid of any transformative power. As Christians, how do we avoid the polarities of bigotry and divisiveness on one hand, and wishy-washy floppiness on the other? I think the key is a proper confidence in what we believe. A security, a rootedness in the Christian faith which is bold in articulating what we believe but without seeking to crush or destroy others. It means holding tight to the objective truth of what we believe, whilst acknowledging that we can learn from others. I think I learnt a lot about confidence in my faith from two great mates I met at Hull University. One was a Muslim who I played in the cricket team with and the other was a Jew who I worked alongside in the Student Union as a sabbatical officer. As a student, too often I was embarrassed when asked about my beliefs, frequently mumbling incoherent thoughts and hoping the conversation would move on to safer ground. Yet seeing the way these two friends lived out and spoke about a religious and cultural identity that was intrinsic to them taught me something important. 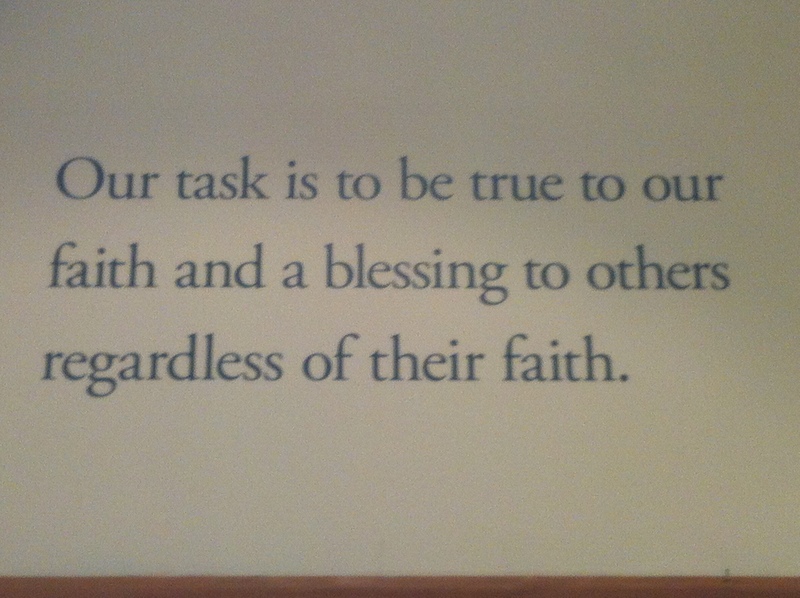 Sacks’ quote sums up a great challenge which people of all faiths need to hear. As Christians we need the conviction to be true to our faith. The truth of the Christian faith asks deep questions. It is inescapably controversial because it shakes things up, challenges the way things are and disturbs the comfortable. We cannot get away from the fact that at times this will cause disagreement, debate and upset. And yet a Christian commitment to the truth is in order to be a blessing to others. Violence, retribution, bigotry and hatred are the worst adverts for the Christian faith because they are the opposite to the path walked by Jesus. Even if people reject our theology, they should be challenged by the way we live. As is seen most clearly in the example of Jesus, nothing bears better witness to God’s truth than a life lived authentically in His service. I have worked with people affected by homelessness for 25 years. This blog is all about how grace and truth is relevant to personal transformation and social justice. See here for more details. How should we respond to people begging?